Marat d'Avignon® has been making tablecloths in Provençal fabric since 1948, taking care to preserve the most traditional motifs. Its know-how is recognized in terms of traditional textile confection. All Marat products are of a very superior quality, both for the fabric and the finish. The Avignon print is one of the most typical drawings of Provence, and comes in very Provencal colors. The stripe print consists of several friezes juxtaposed with various patterns in contrast on a background of color. Calissons bands alternate with narrower and more graphic lines. Floral garlands are inserted and break symmetry. Aside from the taste cases, it seems that the stripe pattern lends itself more to great occasions, while Avignon allover is simpler. We recommend the rectangular red as Christmas tablecloth that will keep its promises. 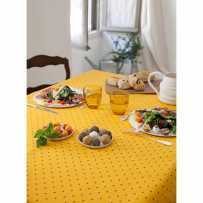 Or maybe the yellow one as an Easter tablecloth ? assorted napkins in allover will create a break on the scenery strips to avoid tiring the eye. The bread basket and its nodes is irresistible. The entire Avignon collection is very refined. Do not miss the other tablecloths (round, square, linear with framed pattern) and decorative items such as table mats and runners, absolutely delightful.